“The power to ride more trails”; rather than being dismissive of bike company marketing tag lines, it’s relevant in this case to give fair consideration to the truth of it. Ultimately it’s referring to the utility of e-bikes in general, and of course the Levo range specifically; allowing riders who want to go faster, further and cover more trail than on their normal ‘muscle-bike’, the ability to do exactly that. My time onboard the 2019 model Levo fulfilled that expectation in spades. After my time on the new gen Levo I have an even better tag line based on my preferred riding style though: “Like trying to wrestle a runaway freight train”. That isn’t implying that the Levo is hard to control, but that if the rider chooses to ride it aggressively, the Levo is more than capable of providing a high-speed, thrilling experience when descending. This is not the first consideration for most riders thinking of the characteristics of an e-bike but is a completely valid one for the game-changing Levo. It’s a bold claim, but for any doubters (haters) out there I’d challenge them to ride with me down my favourite local root-infested downhill trails. I guarantee I’m as fast, or faster on the Levo than my regular trail bike. As a real-world application of that impression - during the photo shoot for the review photos we deliberately decided not to include a climbing photo. The Levo is so much more than a bike with a motor to make climbs easier – it’s a bona fide trail bike that happens to have motor assist. A much as I may appreciate a whippet of an XC-oriented trail bike, a bulldozer of a DH rig or the fact that there are a range of riders out there with different requirements of a bike than me - I’m an ex-downhill racer first and foremost so will always be most critical of a bike’s descending prowess. This attitude raised itself early in the review process with my first ride of the Levo Comp, effectively turning into a complete mission - in a good way. I never found it’s limits on descents before I hit my self-preservation threshold. In general, e-bikes offer different advantages to different people with varying requirements. Some use them to help them access trails they just wouldn’t be able to otherwise due to any number of reasons including limited physical health or injury. A less recognised but completely viable segment is those who are relatively fit and able and are early adopters willing to maximise the advantages modern technology that e-bikes offers. I’m firmly in the second group, and the Levo is equally firmly a prime option for hard-out trail riding. All this talk about its aggressive capabilities isn’t to say the Levo range isn’t equally at home for more cruisey riders – in fact we have an upcoming story about precisely that in the upcoming issue 92, on this exact bike. At the end of the day, a competent rider can hammer technical trails on the Levo and have a huge amount of fun in the process. Be aware though, the harder you ride it on the descents, the more of a workout you’re going to get for your upper body and core. This is not a bad thing at all, but as with all things – the most rewards come from the greatest efforts. After my aforementioned four-hour smash-fest I admit I needed a wee lie down on the couch once I returned home. Whoever thinks e-bikes aren’t capable of giving the rider an honest workout obviously haven’t had the fortune of riding the Levo to its strengths. 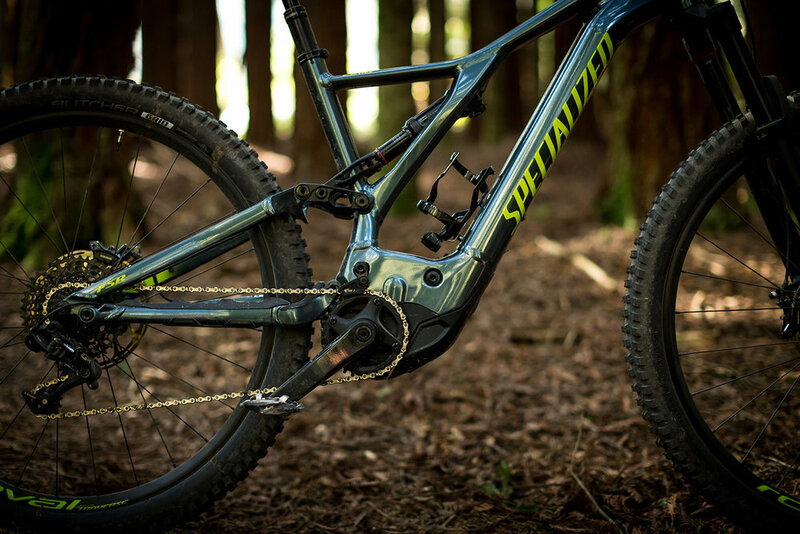 There are many other details of the 2019 Levo that contribute to its performance and trail-worthy character; check out the full review in issue 91 of New Zealand Mountain Biker magazine for details of the multiple facets which make the Levo the trail-smashing beast that it is.